A strategic axis that was threatening to develop between Myanmar, China and Pakistan has been nixed by the Southeast Asian country’s growing ties with Russia and India. 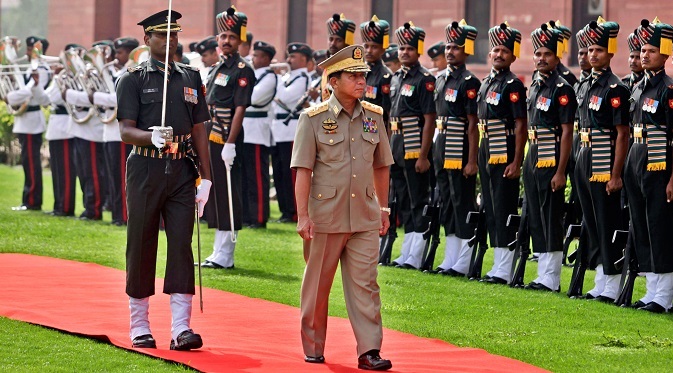 A mini version of the Great Game is being played out in Asia – and the prize is Myanmar, strategically overlooking the main shipping channel that connects the Indian and Pacific Oceans. Long boycotted and forgotten by much of the world, the Buddhist country’s military junta – perhaps unwillingly – had developed strong military and commercial ties with China and Pakistan. Part of the blame for Myanmar tilting towards China and Pakistan goes to next-door neighbour India. Showing a complete lack of realpolitik, New Delhi had shunned the Myanmarese military rulers while openly supporting the opposition leader Aung San Suu Kyi. The friendless junta opted for 'friends' who were available. At one time, Myanmar used to refer to China as “paukphaw” – the Myanmarese word for sibling. The strategic and military relationship between the two resulted in Chinese fighter jets, tanks and missiles pouring into Myanmar. Military advisors soon followed and soon the army, air force and navy were being trained by Chinese officers. In return China got access to Myanmar ports, offering Beijing with strategic influence in the Bay of Bengal, in the Indian Ocean region and Southeast Asia. Worryingly for India, China built a massive intelligence gathering network on Great Coco Island. Located just 18 km from India’s Andaman & Nicobar Islands, it allows China to monitor India's military activities, including missile tests, in the area. Pakistan followed in China’s wake. In 2001, three Pakistan Navy vessels - a submarine, tanker and destroyer - visited Yangon Port. This was an unprecedented development because until then Myanmar had maintained it would not permit foreign navies to visit the country. Despite deep defence ties the Myanmarese were loath to buy their insurance policy from just two countries – especially when one of them was a known international outcaste. Myanmar had never quite forgotten that in 1963 Moscow had provided the newly installed military government with three helicopters. Russia, having lost ground in its former strongholds such as Iraq, Libya and Syria, also saw an opening into a growing market. In 2009 Moscow cracked that market, selling the Myanmar Air Force 20 MiG-29s in a $570 million deal, edging out the Chinese who had offered their knockoff fighters. Russia’s MiG Corp also pitched in, helping upgrade Myanmar's main military airstrip. Russia also sold Myanmar Mi-35 attack helicopters, aircraft trainers, artillery guns, air defense systems, tanks, radars and communication equipment. According to Wikileaks, Russian diplomats were able to connect with the secretive Myanmarese generals. “Russia has exceptional access in Naypyidaw (the capital), including to top military leaders; and [the Russian ambassador] has been the most outspoken defender of the regime’s policies, including its human rights record during sessions with visiting UN officials,” reads the leaked cable. The Myanmarese generals were glad they had made the right buys. The cable shows Russian helicopter gunships were successfully deployed against Kachin rebels. Alarmed by the Chinese military and intelligence gathering bases in Myanmar, India has taken a long-overdue policy u-turn. Indian military supplies are now trickling into the country. These include maritime patrol aircraft, naval gunboats, 105 mm light artillery guns, mortars, grenade-launchers and rifles. India has reported agreed to Myanmar’s request for assistance in building offshore patrol vehicles (OPVs). More importantly, it has green lighted a request to double the number of vacancies for training Myanmarese Navy officers and sailors from the current quota of 50. India will also train Myanmarese pilots to fly Russian-built Mi-35 helicopters. According to The Diplomat, Myanmar is currently engaged in a competitive naval buildup with Bangladesh, particularly since the maritime standoff between their navies in 2008, which did not portray Myanmarese naval capabilities in a particularly good light. It is in this backdrop that Myanmar has asked for more from India – new radars, sensors and sonars for its naval frigates and corvettes. In a sign that India is shedding its Gandhian reticence towards military exports, the Defence Research & Development Organisation’s hull-mounted sonar (HUMSA) – which is designed for small frigates, corvettes and OPVs – is being exported to the Myanmar Navy. The sonars are also part of a larger pipeline of naval sensors being supplied to Myanmar, which has in the past included BEL-built RAWL-02 Mk III L-band 2D search radars and commercial grade navigation radars that are being sported by Myanmar Navy ships, reports The Diplomat. The primary offensive weapon of these ships is the Russian built Kh-35 Uran anti-ship missile. While India would like to play a larger role in Myanmar, especially its democratisation process, the junta is in no hurry to travel that path. Instead they find the Vladimir Putin school of democracy more suited to the needs of a developing country that is reeling under separatist movements. According to Asia Times, Myanmar appears to be looking elsewhere for inspiration and ideas. In July this year, a parliamentary delegation from Myanmar led by speaker Shwe Mann visited Russia as part of a "fact finding mission" on Russia's democracy model. “Given their wariness of democracy in the first place and particularly one that is argumentative and noisy like that in neighboring India, Myanmar's rulers, who have often spoken in favor of a ‘disciplined democracy’ are looking to Russia for ideas….,” says the report. Considering the state of democracy in India, you couldn’t fault the Myanmarese for looking elsewhere. As long as Myanmar is being weaned off both Beijing and Islamabad, New Delhi should count its blessings.